1. Heat a stockpot over high heat with water and salt. 2. Bring to a boil and add the pasta. 3. Cook the pasta as per package instructions, drain and transfer to a bowl. 4. Add 1 tblsp of the sun-dried tomato oil and keep aside. 5. Add 1 tblsp of the artichoke marinade with lemon juice and keep aside. 6. Once the pasta has cooled, add the marinade mixture. 7. Add the artichokes, sun-dried tomatoes, olives and basil leaves. 9. Serve at once or keep in the fridge till required. 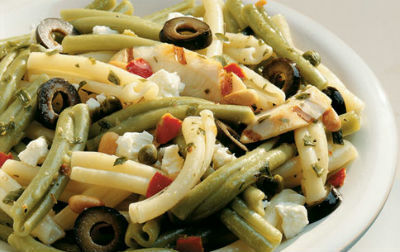 Feel free to comment or share your thoughts on this Mediterranean Pasta Salad Recipe from Awesome Cuisine.